This is one of Parker's absolute favorite recipes, and it is a quick go-to meal for me on weeknights. Fun fact, this was actually the first meal I ever cooked for my husband. After I moved out of the DG house and into an apartment, my then-fiance-now-husband bought me my first cookbook. I sifted through it and decided on this recipe. Honestly, this is one of the easiest recipes I make, but it's sooooo good. Complete with BBQ, beef, and bisquick, it's the perfect guy meal. Ready for the best part? It's a whopping $1.04 per serving. This cookbook is called Money Saving Meals, and all of the meals are not only extremely cost effective but also very quick and easy to prepare. Combine that with the fact that they are delicious, and you've hit the trifecta. I actually had a friend over for dinner the other day and made this recipe. I had the cookbook sitting on the counter, and after thumbing through the pages, she grabbed my computer to purchase it on Amazon. 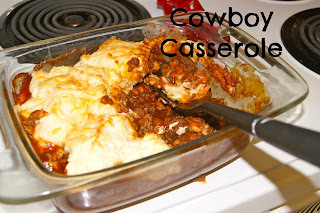 It's full of lots of great recipes, but Cowboy Casserole is by far my favorite. 1. Preheat oven to 425 degrees. Cook beef in a skillet and drain fat, if any. Stir in baked beans and barbeque sauce. Heat to boiling, stirring occasionally. Pour into a casserole dish. *Note: The first time I made this, I used a large rectangular pyrex dish. I have since used the smaller, square pyrex dish, and it makes a much better meat-to-bisquick mix ratio. 2. Meanwhile, in a medium bowl, stir bisquick mix, milk, and butter until soft dough forms. Drop dough by spoonfuls onto beef mixture. 3. Bake uncovered 18-22 minutes or until topping is golden brown. Sprinkle with cheese. Bake about 3 minutes longer or until cheese is melted. Let cool 3-5 minutes and serve! This looks so yummy! I've seen this before buy have never made it! I think my husband would love it! Thanks so much for linking up today! !